I'm really appalled at how low this book is ranked on this site! In my opinion this book is the absolute Bible of pick up. Almost every PUA product I've come across is either a shameless clone of this material, some reaction against it or various attempts to push the medium with this book as the foundation. In general there are so many books out there that are so padded with fluff, while still others are convoluted and a nightmare to read. 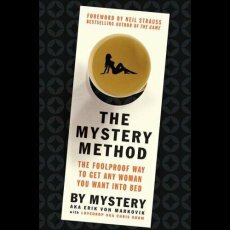 The Mystery Method is condensed, succinct, and to point. I really feel like the M3 model was a breakthrough in pickup and seduction. I found it so incredibly nice to have a structured template to follow when I was out meeting women. For me it just brought order to all of the social chaos. I was able to start using this stuff right away and would go so far as to say it changed my life.